Gordon Vears was born in Gloucester in 1884, the younger son of A W Vears, popularly known as “The Commodore”, who was Chairman of both Gloucester (Rugby) Football Club and the Gloucester Football and Athletic Ground Co Ltd. As a boy he lived at Brunswick Square, Gloucester. Gordon attended the Crypt School, but by 1901 he had become a Mechanical Engineering Pupil. He started playing rugby football at junior club level with Hucclecote under A C Chadborn, later joining the Gordon Wanderers, where his form caught the attention of Gloucester Club officials. He was an all-round athlete, distinguishing himself at football, rowing and boxing as well as rugby. He was a forward, and at 6ft tall and weighing 11st 7lbs, he was particularly useful in the line-out, a sterling scrummager, a keen tackler, and could always be relied upon to follow up enthusiastically. 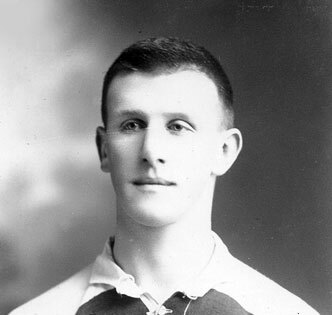 Gordon joined the Gloucester Club for the 1902-03 season, during which he played at least 16 games for the “A” team (he may have played more, but the records are incomplete). However, his talent was quickly apparent, and he was soon selected for his first game in the 1st XV on 1st November 1902 against Stroud at Kingsholm, alongside his elder brother, Lindsay, who kicked a conversion in the 11-0 victory. By the end of the season Gordon had chalked up 5 appearances. He came into a team which, under the captaincy of George Romans, was going through relatively lean times, struggling to win more games than they lost. The following season, 1903-04, Gordon became a first choice in the eyes of the Gloucester selectors, and appeared in 28 of the 34 matches played (although still managing 5 appearances for the “A” team as well). In his summary of the season, “WB” of the Citizen, recorded that “the pack for the most part comprised old and experienced hands, the exception being Gordon Vears, who gained a regular place in the eight”. He was to remain a key member of the Gloucester pack for the next ten seasons. In 1904-05, Billy Johns took over the captaincy, a very popular appointment with the players, and, although results went against them in the early part of the season with weaknesses continuing to be apparent amongst the backs, there was a marked improvement from Christmas onwards, with Arthur Hudson starting to make an impact at wing three-quarter. Eventually 23 matches were won out of 36 played; Gordon Vears made 30 appearances, and played a distinguished part in a pack which was regarded as rather light but unusually quick around the field. During this season, Gordon was selected to play a friendly game for the Gloucestershire County side, and had the distinction of scoring a try (a rare event in his playing career). The team enjoyed a second successful season under the leadership of Billy Johns in 1905-06, winning 26 of 37 matches, the 661 points for being a Club record. Gordon made 26 appearances. On 19th October 1905, Gordon played for Gloucester against the All Blacks, and had the unexpected pleasure of his brother, Lindsay, at full-back, when George Romans had to drop out before the match with injury. The All Blacks arrived at Kingsholm having won all 9 of their previous matches, racking up 341 points against 7. Gloucester decided to take the field with three half-backs and only seven forwards, a plan which did not meet with success. The Gloucester pack were outnumbered, outweighed and outmuscled, and Gordon’s day was not made any better by a good shoeing. As the match report records “G Vears picked up and tried to clear, but he was tackled, and though he let the ball go he was badly kicked by an opponent, the spectators shouting in indignation. Vears had to receive the attention of the ambulance men, but was fortunately able to continue.” However, Gordon did show up as one of the few conspicuous successes in the Gloucester team. The final result was defeat by 44-0. On 9th December 1905, Gordon won his first cap in the County Championship against Somerset at Bath, and retained his place for the following match against Cornwall. Towards the end of the season, on 17th March 1906, Gloucester entertained Plymouth at Kingsholm, and rather inhospitably handed out a 71-0 thrashing; in the course of this game, Gordon scored the first try of his Gloucester career, although he was outshone by his brother, Lindsay, who helped himself to 6 of the 18 tries scored that afternoon. In his summary of the season, “WB” singled out Gordon as a “sterling scrimmager and consistent performer”. In 1906-07, Gordon played in 28 of Gloucester’s 34 fixtures, under the captaincy of scrum half Dai Gent. In a season of moderate results, Gordon was described as “a hard worker who added to his reputation”. 1908 was also a memorable year for Gordon in his home life. He had been living with his parents at 22, Deans Way, Gloucester, but married Grace Taylor that summer, and the couple moved into their own house, just down the road at 30, Deans Way. They had 2 sons, Michael, born in 1911, and John, born in 1920. On 24th December 1908, Gordon captained a Gloucestershire team containing 11 Gloucester players, which beat Racing Club de France 39-0 at Kingsholm, but he was not selected for the County Championship matches. Gordon was his usual reliable and available self during the 1909-10 season, when he played in 34 of Gloucester’s 38 fixtures, and again frequently deputised for Arthur Hudson as captain. Arthur returned to the fray on 2nd October 1909, almost a year after his previous appearance, but was then absent when playing in international and county games, so managed only 13 games for his Club. WB recorded that “The duties of leader again fell on Gordon Vears, and a more enthusiastic and hard-working forward it would be difficult to find.” Gloucester recorded 23 wins, 8 losses and 7 draws. Gordon scored one of those tries which were so rare in his career during a 17-0 win on 29th January against Cheltenham, and also took part in the 18-0 win over Lydney in the County Cup Final. In 1910-11, Gordon played rather fewer games – 23 out of 40 fixtures – but WB still rated his contribution highly – “the City were able to command the services of a fine pack (of which) Gordon Vears proved an efficient leader”. Perhaps the highlight of the season for him (and the rest of the team) was the trip to Toulouse, which took 6 days to complete. The match was played on 28th February 1911, and the result was Stade Toulousain 13 Gloucester 18. At this time, Gordon was employed as the Assistant Works Manager for a Mechanical Company. In summarising the 1911-12 season WB again acknowledged Gordon’s role in leading an outstanding pack – “It is a real pleasure to testify to the magnificent work accomplished by the pack so ably and enthusiastically led by Gordon Vears. Gloucester were fortunate in starting with a good leaven of experienced players, and the men in every respect fully sustained their reputation. The most notable triumphs of the season were largely due to the efforts of the forwards, who never really played a bad game. In the stern contests with the leading Welsh clubs the City pack came out splendidly and they were the one part of the team that always upheld the Club’s reputation when operating in Wales.” He also notes that Gordon was a “sound scrummager”. Gordon would have been particularly proud of the Club’s unbeaten record against Welsh clubs at Kingsholm, with 7 wins and 2 draws. This fine form brought Gordon back into the County side for 5 further caps against Glamorgan, Devon, Somerset, Hampshire and Cornwall, but he was still able to play in 31 of Gloucester’s 40 fixtures. Gordon would have been particularly proud of the Club’s unbeaten record against Welsh clubs at Kingsholm, with 7 wins and 2 draws. Gordon would have enjoyed a further outing to France – this time a 3-day trip to Paris to play Stade Francais. It proved just as enjoyable as the trip to Toulouse, and resulted in another victory, 13-3, Gloucester scoring 2 goals and 1 penalty against 1 try. The match was played on Thursday 14th March 1912, and afterwards the Stade Francais club entertained their visitors to a memorable banquet. Gloucester travelled home the next day, not arriving home until the early hours of Saturday morning, which may have contributed to their rather dismal 0-3 loss to Cinderford later that day. Representative honours with Gloucestershire again limited Gordon’s appearances for the Club in 1912-13. He played against Devon, Somerset, Hampshire and Cornwall in the group stage of the County Championship, which secured qualification for the knock-out stages. In the semi-final, the Midlands were defeated 6-0 at Kingsholm, and on 1st March 1913, Gordon was accorded the honour of captaining Gloucestershire in the final against Cumberland at Carlisle, which was won 14-3. This was Gloucestershire’s second County Championship title, and the highlight of Gordon’s career. He also played for the County against South Africa at Bristol on 29th December 1912 in an honourable 0-11 defeat. He still managed to play in 25 out of Gloucester’s 40 fixtures, and scored his last try for the Club against Cheltenham on 20th February 1913. However, this was to be his final season for Gloucester, his last game being a 0-0 draw at Cinderford on 26th April 1913. He finished with a Gloucester career record of 286 appearances and 4 tries, spread across 11 seasons, 1902-13. His departure from Gloucester was caused by a business appointment which necessitated his moving to Walsall. He was too keen on the game, however, to give up playing, and he immediately joined up with Moseley, but was only able to play for them for one season before World War One brought a halt to rugby. Gordon did not enlist or get called up into the Armed Services during the war, because he was required for war work and hence was in a ‘starred’ occupation. He worked at an engineering works in Walsall and joined the local Volunteer Training Corps (forerunner of the Home Guard). His enthusiasm for the game remained undiminished after the war, and in 1919 Gordon turned out for Leicester at the age of 35. He returned to Kingsholm with the Tigers on 13th March 1920, and helped to inflict a 3-0 defeat on his old Club. He played two seasons with the Tigers before finally deciding to end his long playing career at the age of 37. His commitment to the game, however, was unabated. He served as an administrator with the Walsall Club, he became a valuable member (and Vice-President) of the North Midlands Rugby Union Executive, and President of the Staffordshire County Union. Gordon died in 3 November 1947 at Walsall, Staffordshire. My grandfather didn’t have two sons he had a boy and a girl and the dates of birth for the girl is wrong, otherwise it’s interesting to read about his love for the sport.